One of the pizzas that my family likes is taco pizza. I use the taco seasoning that I posted a couple of weeks ago and the pizza crust I posted last week. Enjoy! Cook the ground beef with the taco seasoning. Drain the oil, if necessary. 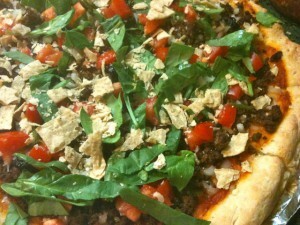 Divide the taco meat, fresh tomatoes and olives on both crusts. Bake as directed until crusts are golden. Drizzle with cheese substitute, if desired (I like to use the cashew cheese sauce for this one). Add lettuce, taco chips, salsa or guacamole as desired.